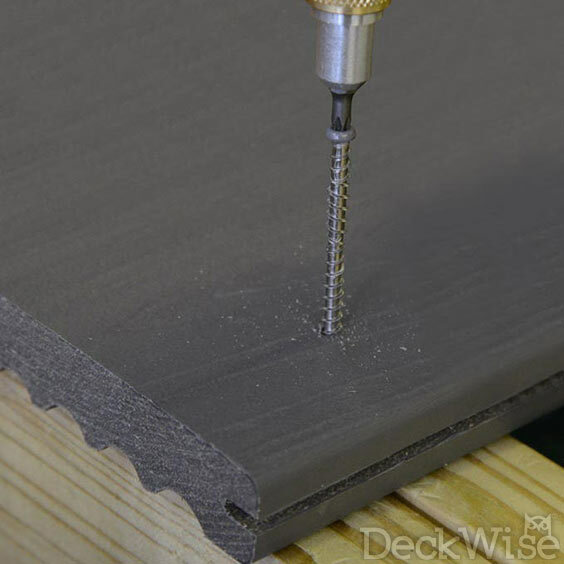 The DeckWise® complete line of professional grade Stainless Steel decking screws are the choice of the Pros ensuring their clients’ decking holds tight to the underlying joists and securely affixed when face screwing. Our Stainless Steel line consists of Colormatch #8 (trim head) painted-head screws, heat-treated stainless steel screws, self-tapping metal joist deck screws and composite deck screws in THREE colors. We maintain a large inventory and a wide variety of decking screws for any building project. Whether your project is exotic hardwood such as Ipe, Tiger Wood, Cumaru, Garapa, Massaranduba or thermally treated American softwoods such as White Ash, Gum, Walnut, Beech or Oak, you can trust your decking project will last for a lifetime. Our fasteners are one of the most adaptable, convenient types of decking screws on the market and are obtainable in multiple styles, colors and sizes. Pro-builders, contractor builders and DIY homeowners can rely on the strength our screws offer just as much as they can rely on the strength of the DeckWise® brand. 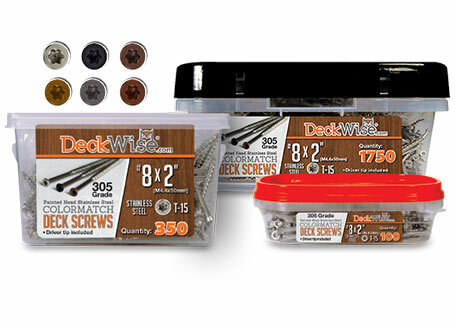 DeckWise® Colormatch #8 painted-head deck screws are forged from high-quality professional 305 grade stainless steel. Choose from Shadowline Black, Hardwood Brown, or Stainless Steel for the perfect match to your decking. They offer an ideal performance with exotic woods and thermally treated wood, PVC and composite decking. These Stainless Steel trim-head deck screws securely fasten decking clips including thermal woods, and composite decking material. 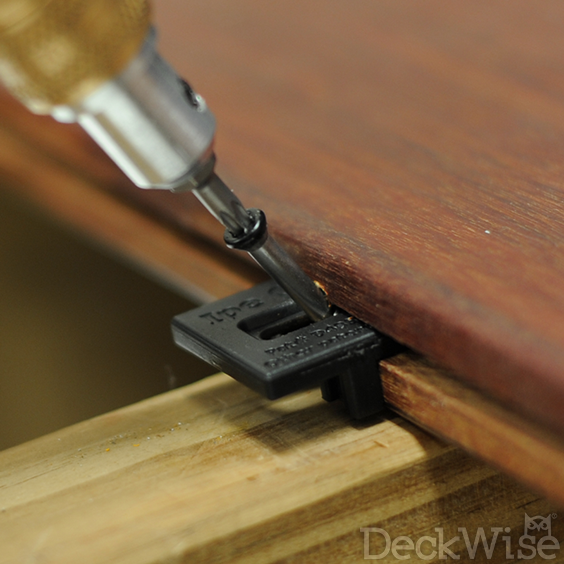 The screws’ trim-style head is far less obvious with hidden deck fasteners or on a deck surface when face screwing. Meaning, these offer a clean, refined look ensuring a flush installation each time. 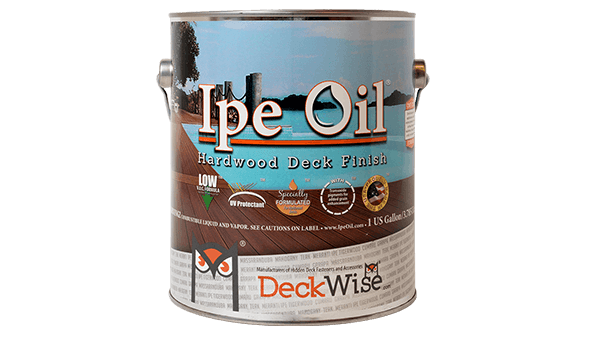 Fasten all types of wood decking including Ipe, Redwood, Cedar, and preservative-treated (PT) woods (non-hardwood) with the DeckWise® #10 Bugle-Head screw. 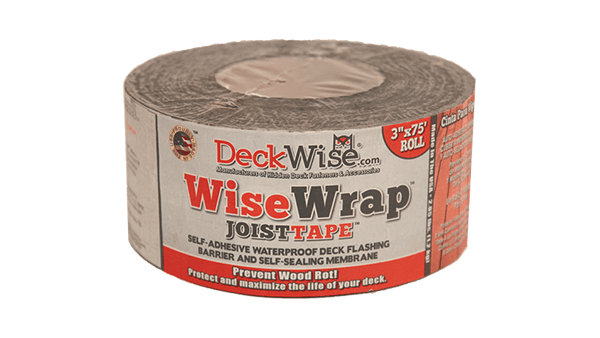 Available in 305 grade for decking and 316 grade stainless steel for salt water installations and higher corrosion resistance from the elements. A SIX lobe T-25 drive ensures a tight bit fit to prevent cam-outs. Pre-drilling is still recommended with this larger screw to prevent wood splitting. 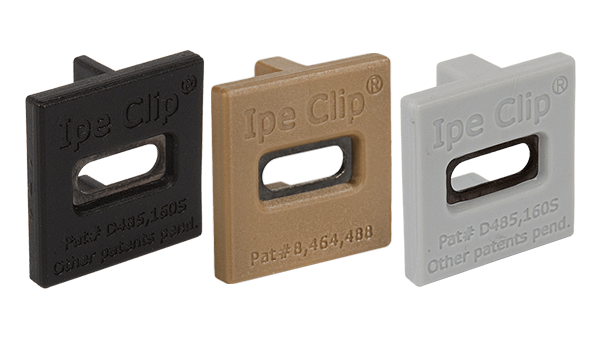 This line consists of 4 signature Colormatch painted heads; Hardwood Brown, Cedar, Outdoor Grey and Stainless Steel to match your decking material plus, an unpainted stainless steel head for general purposes. 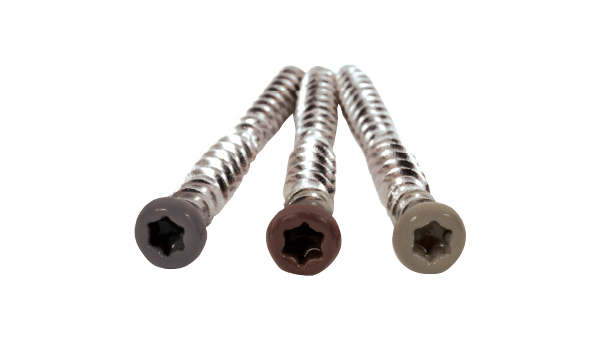 These Stainless Steel T25 drive deck screws swiftly penetrate decking with a type-17 auger point including coarse threading which pulls boards tightly together. Less Stripping, Less Snapping, Less Headaches! 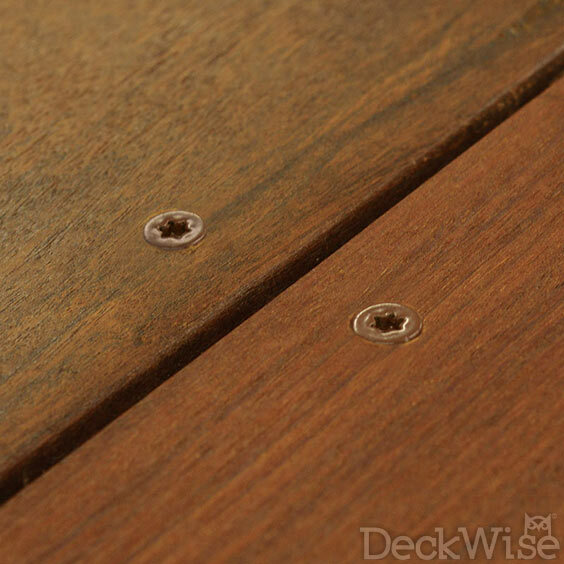 The NEW DeckWise® HTSS™ decking screws are the ultimate strength solution for fastening decking. In this demanding industry, professionals rely on their ability to get return business by building projects they can count on for long lasting results. The heat-treated screw comes with a four sided nail point for quick penetration and serrated threads to push material out of the way. 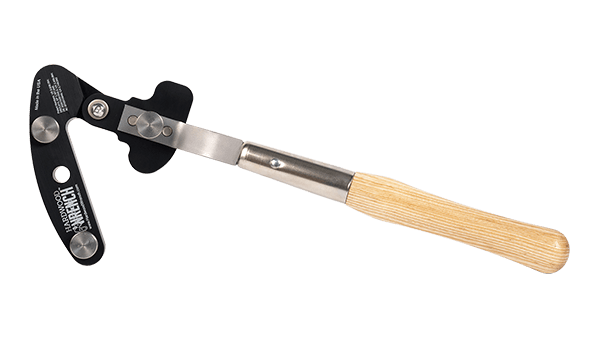 The superior hold-down control keeps boards locked down and will not allow back out such as nails commonly do. 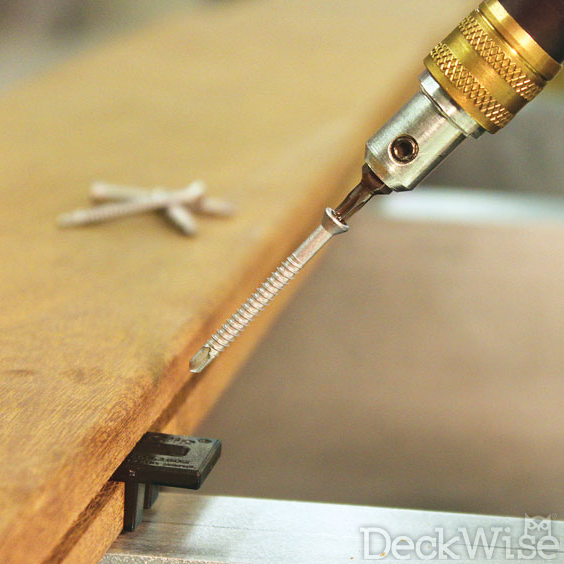 The Ultimate Composite Deck Screw! Our Composite and PVC deck building screws are for use with composite and other plastic based materials. Specially designed to reduce unsightly mushrooming, which could arise when using composite decking, the flutes grab tight pulling the material snug to the framework underneath. 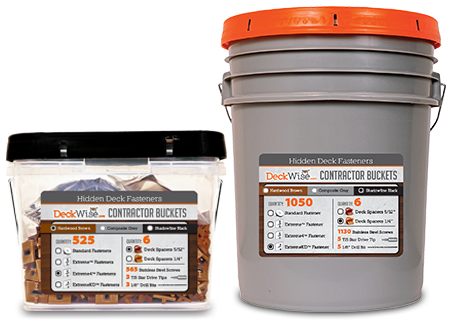 Our deck fastener screw is fail-safe to produce a crisp finished surface without the need of pre-drilling in all THREE varieties of synthetic deck boards: composite, PVC, and capstock. With an anti-fade painted head, they will last for years to come and ensure a pristine surface. Tougher Than The Man Of Steel! Every day, more deck builders and architects are specifying metal joist framing substructures to produce longer-lasting, low maintenance decks. 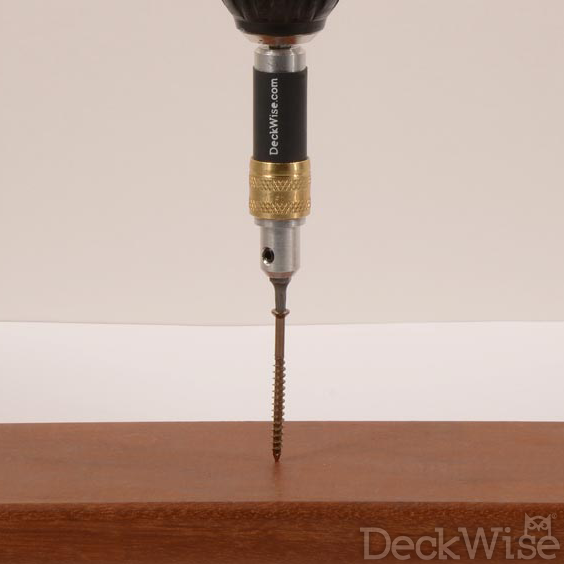 This DeckWise® line of self-tapping deck screws was designed explicitly for metal applications. and hardwoods to aluminum or steel. The Xylan coated #3 drill point and lead threads are tough enough to drill through metal and the load-bearing shaft area remains forgiving to remain ductile and resistant to stress cracking. It is a high performance 410 stainless steel fastener which allows Pro builders and DIY installs a uniform and long-lasting solution for metal joist decks.